Accounts of Monday's events in the second week of social upheaval following the murder of Alexis, including a leaflet by Albanian migrants. They say that their demo was not really planned, a sms message got the most of them only today calling them for a demo, so they just got their instruments and came down. No political party or movement was responsible for that call it was just the willing of that people that wanted to be on the streets to demonstrate together with the youth against police brutality, in their own unique way. Their petrol bombs was their music. But the police decided they did not like it so they started spraying towards them with chemicals, at one guy directly to his eyes !! The musicians quickly left the area, they were not formed in a block anyway in order to try to defend from a police attack. Although comrades did also exist in the area, any action to try to stop the attack of the police could be dangerous, as there were a lot of people around watching at that point, and they could get injured. The demo at 18:00 that was called from the comrades of the taken over Law Department, was relatively big, a few thousands appeared (difficult to estimate correct number). The demo did its normal route from Stadiou and Panepistimiou str, passing quite close from the parliament buidling. It was a passionate and peacefull demo with a lot of chanting. Tension was created outside a well known cafe at Panepistimiou str, when comrades started throwing paint and yoghurt at its entrace, and chanting towards the ones inside : "You that you are staring at the demo, wear bullet proof vests, the police is passing" and also "when the cops will start murdering your children, you will get out of your cages". The demo finished peacefully at Propylea. 4 people more went to prison today, waiting for trial. Also in prison waiting for trial, during the last days of the uprising, are 5 more people in Athens, 4 in Larisa and 3 in Kozani plus 25 immigrants from Athens for looting. A very large number of demonstrators have been detained during the last week, it is not clear yet exactly how many of them are actually arrested and will pass from the public attorney and how many not. In the most taken over university departments, general assembly meetings are taking place in order to vote for the forthcoming actions, in all up to now they have decided to continue their take overs. More general assembly meetings will take place tomorrow and in other departments. In Larisa, a 250 people demo started at 19:00, the half of them being anarchists and the others people from radical left groups. It passed from the court building and the police station of Larisa, stones and fireworks were thrown, and the police responded with chemicals. Road blocks got formed and a riot started with the police but did not last long because there was a clear danger that the comrades would get trapped. Yesterday I forgot to mention that the building "Galaxias" in N. Smirni (a suburb of Athens) is also taken over by comrades and it is used as a coordination centre for the actions that will take place. 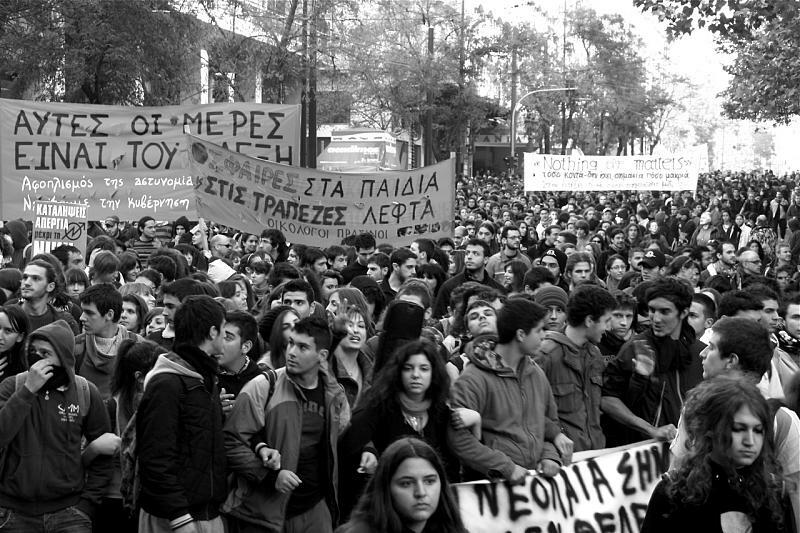 At 12 o clock today a high school student demo was announced outside GADA, the Police Headquarters of Athens. A big number of school students attended as well as comrades, parents of the kids and other people. There was a heavy police presence, in all streets and alleys around GADA. The kids in a lot of occassions confronted the police, and there was tention during the whole demo. At the end, when the public had started leaving and the school kids remained there, there was an attack by the police to them. The kids responded with yoghurt, flour, fruit as well as stones, but the police managed to break the demo in three parts and send them to different directions. At least 2 kids have been arrested, one teenage boy was pent down by the police and was sprayed with chemicals although it was down arrested and not able to move. On the same time, school students from other areas of Athens but also from all over Greece, demonstrated outside their police departments. Riots started and at Koridalos (a suburb of Athens) where also the biggest high security prison establishment of Greece exists. The school demo was leading towards that direction (the prison) but was stopped by police. A lot of chemicals were used, the demonstrators responded with stones and petrol bombs. In Thessaloniki, the town hall of Sikeon was taken over, there will be an open public meeting there on 19:00 today. In Mytilini (greek island) 3 different radio stations were taken over by comrades and broadcastes. Also an another one at Ioannina was also taken over. Finally a radio station was taken over in Rethimno, Crete, by anarchists and anti authoritarians and broadcasted live as well. A big demonstration at 6 o clock will start today from Propylaia. My shift at work is allready over so I will head down for that demo as well, I will give you updates later on today. 14.52 Another four of last week’s arrestees appeared before the prosecutor today, who ordered their pre-trial detention (which can, and more often than not lasts one year in Greece). This, combined with the pre-trial detention of arrestees in small cities (i.e. in Kozani and Larissa) shows the greek “justice” will be following a zero tolerance approach with anyone suspected of participating in the revolt. As the prosecutor told the arrestees in Kozani, “the police can no longer deal with you - so we will”. 14.42 The peaceful student sit-in outside the police headquarters on Aleksandras Ave is unprovokenly attacked by police with tear gas. The crowd dispersed in three groups, all of which started fighting back with stones and spontaneous small barrickades. At least two arrests - one young male student was arrested, handcuffed and then teargassed and kicked in front of us. People tried to save him from the police but it was impossible. Indymedia reports that another young female student was injured in the head by the pigs. The anti-police sentiment on the streets is simply phenomenal. In the next few minutes, high school students will be gathering outside the police headquarters on Alexandras Ave - an unprecedented move even for leftie/ anarchist groups. But the students have already overcome nearly all conventional forms of political action, so far. A solidarity meeting is called for today outside the main courthouse in Athens, in solidarity with the arrestees - the pre-trial detention (or not) of many of them is to be decided today. In the early hours of Monday morning, a well-know local fascist/mafia-type with two others, armed with a gun and a bat threatened the people inside the occupied building of the town hall of Chalandri in Athens. The people in the building were threatened with the firearm, one person was hit in injured with the bat and forcibly told to leave. So they departed, to prevent things from getting worse, and re-occupied it a few hours later as it was not locked. The mayor of Chalandri denies that he has any connection with those people, it is clear though that we are talking about paid men who were there on a mission and not some "angry civillians". The police helicopter is hovering over Athens for the ninth consequtive day. We are off to the police headquarters gathering; more reports to follow. The following text was distributed at the student picket outside the police headquarters today by people from Athens’ Haunt of Albanian Migrants. I wanted to translate and upload it here because it shows something very important: that ties of solidarity are being formed and strengthened across different sectors of the Greek society - a wonderful thing! These days are for the everyday police violence that remains unpunished and unanswered. They are for the humiliations at the border and at the migrant detention centres, which continue to date. They are for the crying injustice of the Greek courts, the migrants and refugees unjustly in prison, the justice we are denied. Even now, in the days and nights of the uprising, the migrants pay a heavy toil - what with the attacks of far-righters and cops, with deportations and imprisonment sentences that the courts hand out with Christian love to us infidels. These days are for the price we have to pay simply in order to exist, to breathe. They are for all those times when we grit our teeth, for the insults we took, the defeats we were charged with. They are for all the times when we didn’t react even when having all the reasons in the world to do so. They are for all the times when we did react and we were alone because our deaths and our rage did not fit pre-existing shapes, didn’t bring votes in, didn’t sell in the prime-time news. These days belong to all the marginalised, the excluded, the people with the difficult names and the unknown stories. They belong to all those who die every day in the Aegean sea and Evros river, to all those murdered at the border or at a central Athens street; the belong to the Roma in Zefyri, to the drug addicts in Eksarhia. These days belong to the kids of Mesollogiou street, to the unintegrated, the uncontrollable students. Thanks to Alexis, these days belong to us all.